“It’s natural that everything that is new interests young people very much. However, the fundamentals are even more important,” says Archbishop of Krakow, Marek Jedraszewski, 68, since December 8, 2016, the episcopal throne that was Karol Wojtyla’s, who then became Saint Pope John Paul II. The Catholic Church in Poland is preparing to celebrate, on October 16, 2018, the 40th anniversary of the election of the first Polish Pope in history. However, 2018 also marks the 100th anniversary of Poland’s independence, after 123 years of foreign rule. 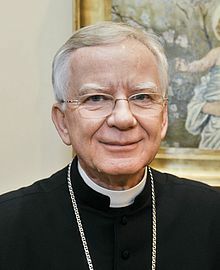 Archbishop Jedrazewski talked about it with a group of journalists during a visit to Rome, found himself for his commitments connected with the John Paul II Foundation, born in 1981, whose head, by statute, is the Archbishop of Krakow. One of the Foundation’s tasks is, in fact, to hand down to future generations Pope Wojtyla’s legacy. “Young people today certainly know who Wojtyla is and that he was from Krakow, but they do not know what he taught in 27 years of pontificate, especially to young people. We must open to them, also knowledge of texts still topical today, especially on the theme of Divine Mercy and of its connection with Saint Faustina Kowalska,” explained Archbishop Jedraszewski. Poland is one of four countries (along with the Czech Republic, Slovakia and Hungary) of the so-call Visegrad group, that on the subject of immigration hold much more restrictive policies than the rest of the European Union. “However, let’s not forget that there is a war in Ukraine. And since 2013, Poland has received more than a million Ukrainians, to whom we must give a house, work . . . We have problems of which, however, the West doesn’t speak much. Finally, the Archdiocese of Krakow is preparing for another significant event. On Sunday, April 28, 2018, in the Divine Mercy Shrine of Lagiewniki, the Prefect of the Congregation for the Causes of Saints, Cardinal Angelo Amato, will preside over the Rite of Beatification of Hanna Chrzanowska, born in Warsaw in 1902 and died in Krakow in 1973, where she knew and was a collaborator of the priest and then Archbishop Karol Wojtyla. Born into a wealthy and educated family, Chrzarnowska dedicated her life to the service of the suffering as a nurse, promoting the formation and professional protection of nurses and nursing assistance to the sick, through a service linked to institutions of the Church and independent of the inefficient national health service. Thanks to her efforts, the custom spread of visiting the sick during pastoral visits and celebrating Mass in their homes. Among the Servants of God in the 1900s, whose Cause of Beatification has opened, is also Jan Tyranowski, humble tailor who in the dark years of the War became the Spiritual Guide of a group of young people of the city. “It’s not difficult to be saints,” he liked to repeat to them. Among them was also Karol Wojtyla, who later recognized that he discovered his vocation to the priesthood in fact thanks to Jan Tyranowski. On January 21, 2017, Pope Francis authorized the Congregation for the Causes of Saints to publish the Decree of his heroic virtues, first step towards Beatification. Zenit asked Archbishop Jedraszewski what values these two figures represent for the Church of Krakow, which then gifted the world with another Saint, John Paul II, and what made them particularly holy. “The fact that Tyranowski, a layman, was a Spiritual Guide for Wojtyla is truly interesting,” answered the Archbishop of Krakow. “This was a sign of the importance of the laity in the Church well before this importance was recognized by Vatican Council II, two decades later. Young Wojtyla had the good fortune to meet on his path laymen who were for him a model of how one lives as Christian laymen in the world, especially in difficult times such as that of the War.